With spring here at last, it’s probably time to check your gutters after a long, cold winter no doubt filled with rain and those every-year-like-clockwork westerly winds. It’s also an important maintenance task if you live in a bushfire prone area as fires are notorious for spreading quickly, and debris in your gutters is one of their favourite fuels! But there are hazards involved with roof maintenance, so here is our guide on how to clean your gutters both efficiently and safely. Why is it important to clean my gutters? Gutters are essentially designed to drain water off your roof, down drainpipes and away from your property’s foundations. This helps keep walls, ceilings and foundations dry. If gutters fill up with leaf litter or other debris, they can capture water and overflow, or water can pool on the roof which will eventually find its way under eaves and into the ceiling or roof cavity. It can also cause your home’s structural integrity to be compromised if it pools around walls, which can cause gradual erosion and the undermining of your home’s foundations. If water pools around your home’s perimeter, it can also impact the condition of the soil, and leaks in gutters and downpipes can cause rust, water stains and timber rot. Excess moisture caused by blocked gutters can lead to bacteria and mould flourishing which is a big issue for those that suffer allergies or respiratory problems. Stagnant water can also attract unwanted pests like cockroaches, rodents and mosquitoes. And gutters choked with leaves is particularly dangerous in bushfire prone areas. Embers from a fire can travel long distances and if they land in leaf-clogged gutters can feed the fire and cause the entire roof to catch alight. All of these issues can be alleviated with regular roof gutter maintenance, and protect not only your roof but your family’s health and safety as well. What’s the best way to clean my gutters? There are some basic steps you need to follow in order to tackle gutter cleaning, and all of them focus on ensuring it’s done both efficiently and safely. Always check your ladder prior to use, plant it firmly on a level surface and lock it into place so that it won’t move. You should also always climb a ladder with at least one hand holding it, and lean in so that your legs are providing additional support. To avoid having to ascend and descend the ladder numerous times, always take all your cleaning supplies up to the roof first. Hoses, brooms and pressure washers can be placed on the roof ready for use and gloves, brushes and other cleaning products placed in a bucket for easy access. 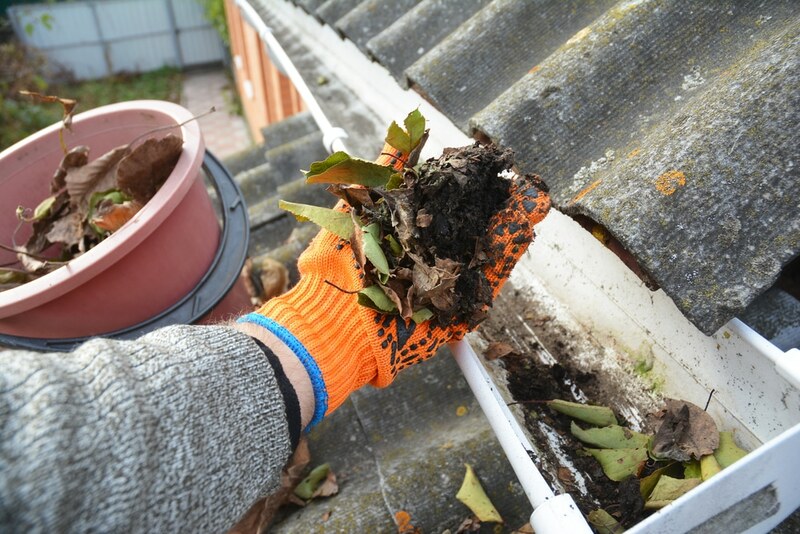 If cleaning your gutters by hand, use thick work gloves to avoid cutting yourself on exposed roof areas and stings or bites from creepy crawlies that might be lurking in debris. Clean one section at a time, starting at the opposite end of the roof and working your way back towards the ladder. Throw debris down onto the ground (rake it up later), and as you clean one section, hose it down to remove any debris you’ve missed. It’s a good idea to have someone assist you with turning the hose on and off so that you don’t waste too much water. Power washers will get the job even quicker, however, be careful the pressure’s not too high as it can remove paint from the roof or weaken any old or insecurely fastened gutters. To remove any stains, use a soft cloth or sponge and some soapy water and don’t forget to rinse! Also, don’t use abrasive cleaning products as they can damage your roof’s finish. What other precautions can I take? 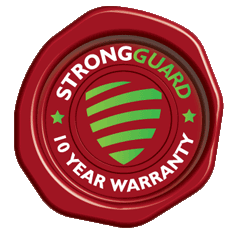 In terms of roof maintenance, gutter guards are not only an ideal way of preventing debris buildup, they have a number of other advantages as well. Gutter guards are basically caps that sit over your gutters with slits in them that allow rainwater to pass through. The caps prevent nuts, twigs, leaves and other debris from entering the gutters. They can also prevent your gutters from prematurely rusting due to moisture-laden debris, and they can stop vermin (like mosquitoes, mice, cockroaches, and spiders) from breeding in the gutters because they can reduce the amount of stagnant water that is collected. They are also a physical barrier to birds, rodents and possums that otherwise might find a way into your roof space. Gutter guards can improve the flow of water through gutters and downpipes, and stop blockages that can occur during times of heavy rain. They can also help your rainwater tank refill more quickly after a decent downpour, and the water will be cleaner as your gutter guards will help filter out debris and contaminants. If you choose gutter guards that are specifically rated for fire protection, it will also mean you’ll have adequate protection in the event of a fire if you are in a bushfire prone area. When and how often should I clean my gutters? In terms of how often you should clean your gutters, it should be done at least twice a year, with the best times being in early autumn and again in late winter after any nearby deciduous trees have finished dropping their leaves. If you’d like to give them an additional clean in the warmer months, it’s best to clean them in spring when it’s not too hot, as nobody likes to be on a hot roof mid-summer! Having said that, eucalyptus and pine trees can shed their leaves at any time of the year, so if you have conifers or gum trees around your home, you may need to undertake gutter cleaning more regularly. This is particularly the case if you live in a bushfire prone area – always make sure you clean your gutters in the lead up to bushfire season which is usually prior to the dry, hot summer months. Checked your gutters and realise they need replacing? Contact us on (07) 3623 4422 for a quote!